If you want to change the look of your room but you can’t paint the walls, or you just want something a bit more creative than regular paint, you can create beautiful DIY wall décor yourself. You’ve surely seen those decals that you just peel and stick on the walls. Well, those can be a bit expensive. We have a DIY method that is easy to do and best of all, cheap. You need contact paper, paint and a specific design in mind. You can take pictures and use adhesive to stick them to the contact paper if you want, but to be really creative, just choose the design that you want and then paint it onto the contact paper. Make sure that you are not painting the sticky side. You can paint as many layers as you want and depending on how bold you want your design to be, two or three layers may be best. Draw out the design first so that you know where to paint and then allow the paint to dry. This usually takes about half an hour for each layer. Once the paper is completely dry, you just cut out your designs, peel the backing off and stick them to the wall. The contact paper will come down easily so if you have to take the design down because you are moving or you have another design in mind, you just have to peel it away. This is a great project for redoing any room and it is inexpensive and really fun. You can be as creative as you like and design any picture that you want. If you have kids, use bright colors and cartoon character designs. Creating your own wall decals is easy and fun and much less expensive than buying wall decals at the store. Wall quotes are very popular for home décor. Whether you want to decorate a new baby’s room, allow your teenager a bit of creativity or you just want to add something inspirational to a living room wall, you can easily paint quotes on your wall and there are a number of stencils available with various words and phrases to help you get started. If you cannot find specifically what you are looking for in a quote, you can always make your own stencils. Once you have the stencil ready, you just have to choose an acrylic paint in the color or colors that you want to use and get started. A clip on stencil level is a good way to make sure that your quote stays centered and level while you are painting. You can combine these two methods and add a beautiful picture along with a favorite quote, song lyrics or anything you choose. This is an excellent way to redo a wall and really spruce up your home décor. 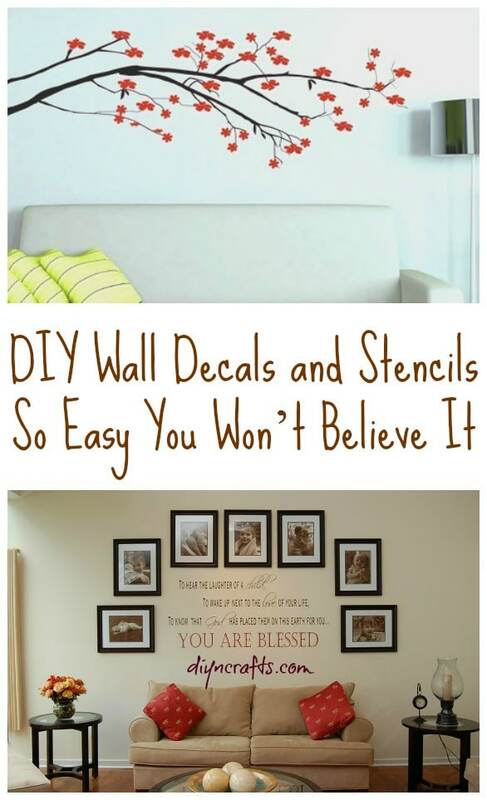 Best of all, it is a fun and easy project that is really cheap and you get a beautiful new wall to show for it. you meant layers of paint, like ‘ coats ‘ but no. Beautiful, creative, simple, stunning. My kind of project. Thanks for posting! Hi, this project looks like fun but I have some questions. What kind of paint do you use? And ehat do you mean by “the layers” ? Also, how much is contact paper?